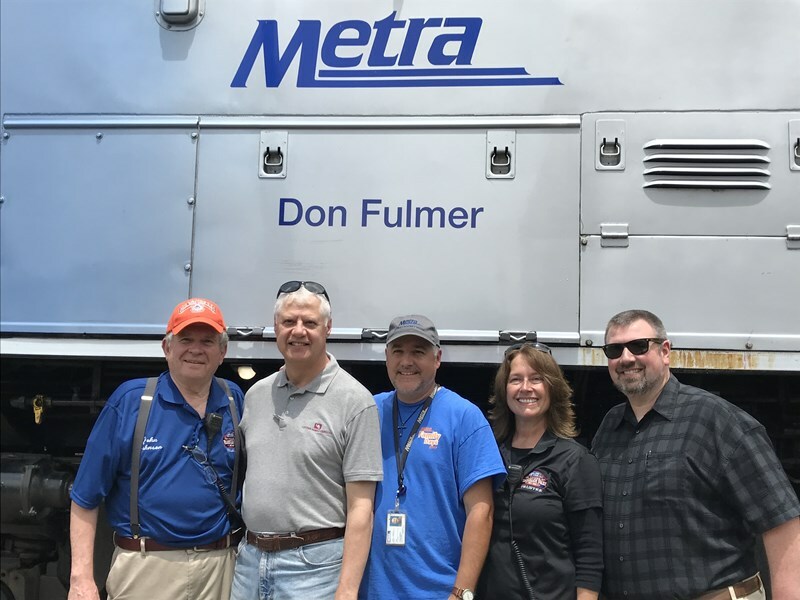 On behalf of the Board of Trustees, we want to offer our condolences to the family and friends of Train Guru Don Fulmer who passed away last month. For over 20 years, Don offered his leadership and guidance to our Annual Railroad Days Festivals. His tireless efforts brought unique and vintage train cars, along with countless train enthusiasts, to our community. Thank you Don Fulmer for your years of service and dedication in honoring Franklin Park’s rail heritage. 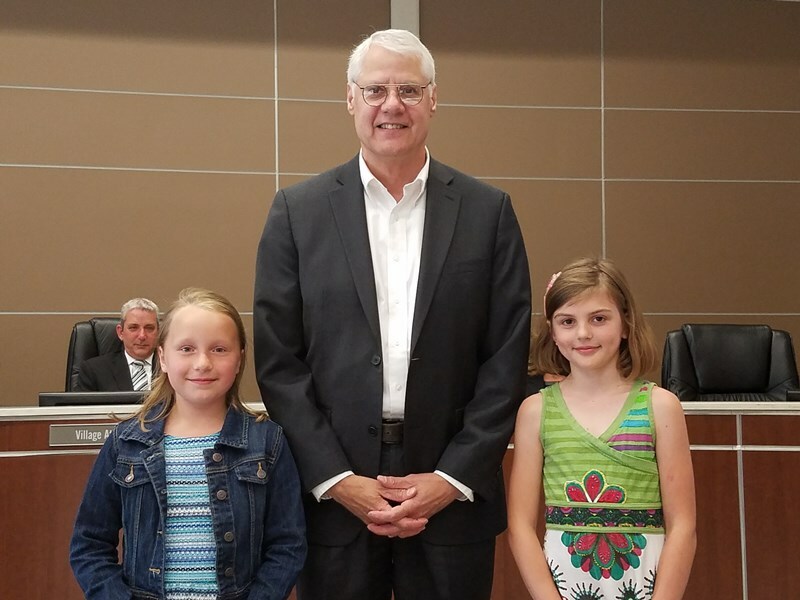 Contest Runner Up Kiley Dec, a 3rd grade student at Scott School and this year’s winner Adela Struzouca, a 4th grade student at Passow School, got to read their essays at the Village Board Meeting. Adela’s essay discussed how to make our town more neighborly which included a plan for a community-wide recycling party. Each year, we hold a “Mayor for a Day’ writing contest open to students in third, fourth and fifth grades. Students are asked to offer their ideas on specific subjects relating to the community and what they would do if they were Mayor of Franklin Park. Though we choose a winner, I believe that every child who enters is a winner. They have demonstrated one of the most important aspects of a working democracy- speaking their mind. Their perspective is unique and authentic.The Board and I welcome their input and we listen to their ideas. I am impressed with the depth and breadth of their understanding of our community’s challenges, needs and opportunities. These students are very well versed in the issues of the day. 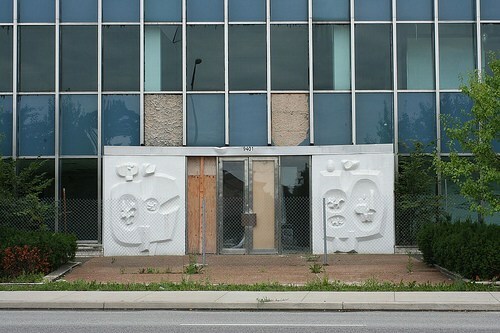 They address subjects of sustainability, immigration, affordable housing and school safety. There are also some great recommendations for ways to provide free ice cream and pool passes! 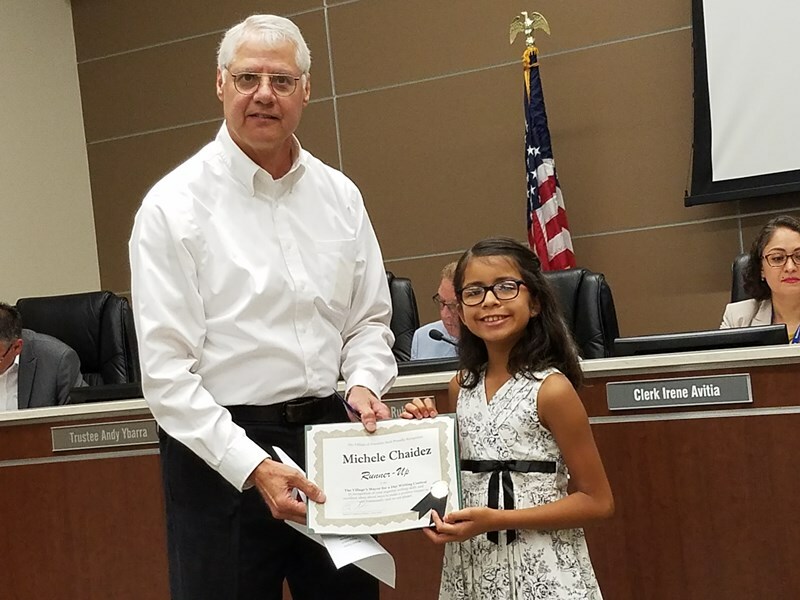 Contest Runner Up Michele Chaidez, a 3rd grade student at Pietrini School was presented with a certificate and gift certificate for her essay by the Mayor. 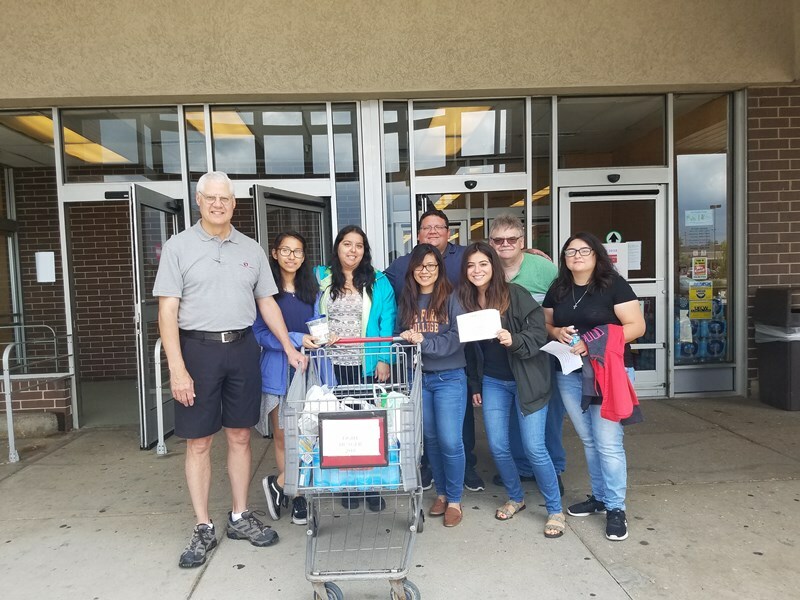 Thank you to everyone who came out on a rainy Saturday afternoon to donate food to the Leyden Food Pantry. Your generosity will help families in need. Also, thank you to those who volunteered to work the drop-off site outside Jewel-Osco. 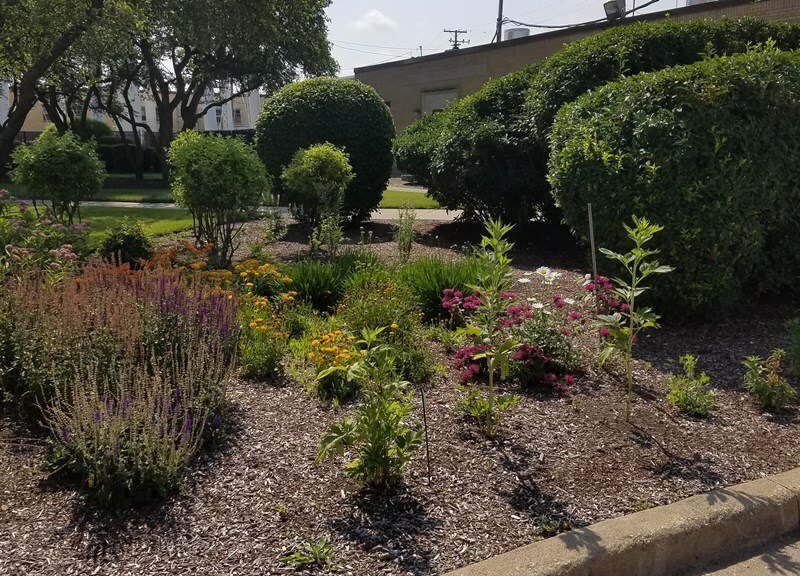 A grant for $1,000 from the Illinois EPA and West Cook County Solid Waste Agency has allowed the Village to plant new trees and to establish a butterfly garden west of the gazebo located at 9501 Belmont Avenue. Thank you for helping to beautify our town! 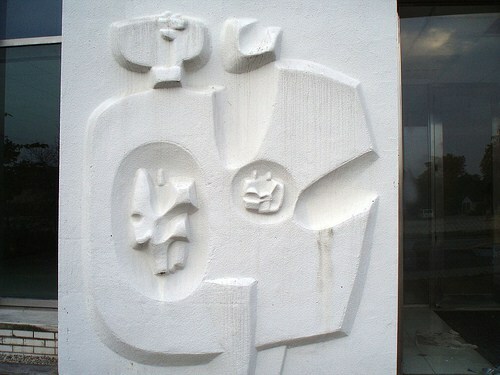 The cement Bas-reliefs were sculpted by the artist Costantino Nivola at the American-Marietta Company’s plant formally located in Franklin Park.They were on display at the Motorola Building and were removed prior to demolition and have been donated to the Village for display again in the near future. 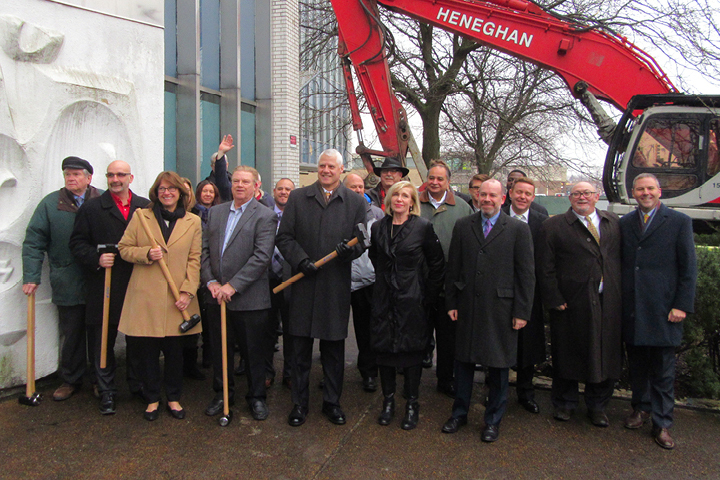 On January 25, 2017, the Village of Franklin Park and Digital Realty held Demolition Day at the former headquarters of Motorola, a vacant 750,000 SF facility located at 9401 Grand Avenue in Franklin Park. WBBM Newsradio's report on the event can be listened to at chicago.cbslocal.com. The San Francisco-based data center firm Digital Realty purchased the 18.5-acre site in 2016, which has sat vacant for over 20 years. Digital Realty plans to demolish the property’s existing offices and warehouse structures in order to build a new 470,000 square foot data storage center and a 78,000 square foot ComEd substation. Digital Realty is the world’s largest data center firm, owning and managing technology-based real estate and digital infrastructure for cloud-based computing globally. The firm operates 156 data centers across 4 continents and 11 countries. Digital Realty originally selected the Franklin Park location due to its close proximity to multiple fiber providers and utility substations, as well as its convenient access to O’Hare International Airport and Chicago’s downtown. According the Village Mayor Barrett Pedersen, “The Village is thrilled to grow with Digital Realty. This demolition marks a historic return of tech-based investment and innovation to the Village.” The proposed data center is an expansion of Digital Realty’s existing 23-acre data storage campus, located directly east at 9333-9377 Grand Avenue. The campus consists of 3 buildings totaling 575,000 square feet. While still in its final phase of construction, the facilities will soon be fully leased. After the redevelopment of 9401 Grand Avenue, Digital Realty’s Franklin Park campus will encompass 41 acres of land. Digital Realty’s demolition of the building and redevelopment of the property will create a significant number of high-tech and construction jobs and generate substantial property and electrical transaction taxes. 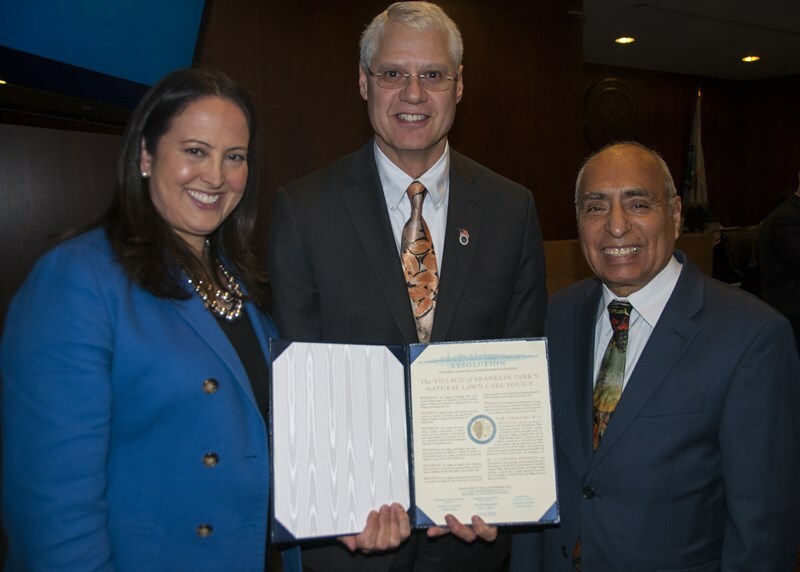 Metropolitan Water Reclamation District (MWRD) President Mariyana Spyropoulos and Chairman of Finance Frank Avila presented Mayor Barrett Pedersen with a special award recently. The award is in recognition of the Village of Franklin Park’s commitment to the health and welfare of our residents and the environment by utilizing natural lawn care on all Village-owned properties and for encouraging and educating residents and businesses about natural lawn care techniques. Do you enjoy our great Franklin Park restaurants and retail establishments? Appreciate the good service you received from a local business? Then help us spread the word! One of the best ways you can support our businesses is to post your positive experiences on websites such as Yelp, Trip Advisor or Angie’s List. Let everybody know what great businesses we have in Franklin Park and help them grow. You can encourage others to try your favorite dish or use a valuable service. Also, consider posting your review as a comment on our Village’s Facebook page. Let’s spread the news about Franklin Park’s attributes and successes! 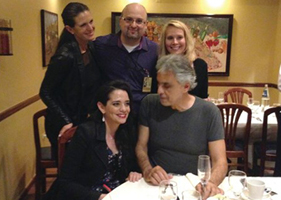 Andrea Bocelli had dinner at Pescatore Palace after performing at the Allstate Arena in June of 2016. The world-renowned singer often dines at the restaurant when he is in town because he loves the great food and appreciates how the staff treats him like family. The newest member of our Franklin Park Police Department. Voodoo is a valuable asset to law enforcement and to our officers. She helps in many ways including sniffing out illegal drugs, explosives and even helping to find missing persons. She also serves as a deterrent to potential troublemakers. 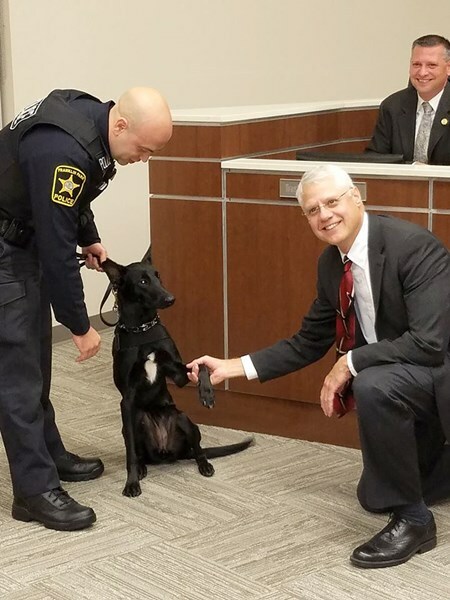 She has been sworn in and is on the job! Voodoo is a big help, but she is also nice to have around! Our aggressive economic development efforts have added over a 1.8 million square feet of industrial development, bringing in $400 Million in investment to our Village in 2016 alone. As a result of our economic development efforts, we have added over 1000 new jobs in the last eight years. Engineers at the Metropolitan Water Reclamation District (MWRD) contacted the Village to partner on their innovative Biosolids Program. Composted biosolids are a product of wastewater treatment that supplies organic matter and improves soil structure to allow plants to more effectively utilize nutrients. The MWRD has been successfully using biosolids on golf courses, athletic fields, public parks and schools in the Chicago area for more than 30 years. The biosolids provide better soil and healthier plants that require less maintenance and make for more robust and durable landscaping. Seven truckloads of the composted biosolids, which looks and feels like dark, fine-textured topsoil, was delivered to the area outside of the King Street Pumping Station. 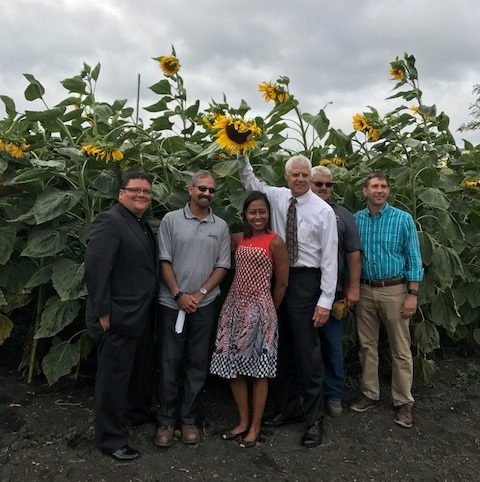 The Village planted heirloom corn, pumpkin and sunflower seeds that have flourished into crops that were harvested and donated to local charities. The Village is always seeking alternatives to using dangerous chemicals and to find ways to promote sustainable practices. Everything we do with the MWRD always turns out green for our Village!